Dub Nutrition Burner Review: Will it Help You Burn Fat? Dub Nutrition Burner is a food supplement developed to support fat loss, weight loss and healthy blood sugar. It was supposedly designed specifically to protect muscle tissue and target the reduction of fat cells. 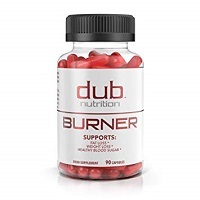 Dub Nutrition’s Burner focuses on healthy and sustainable weight loss by addressing five key factors for safe weight reduction. These key factors include: mental alertness, appetite control, athletic performance, fat oxidation, and water balance. At the time that this Dub Nutrition Burner review was created, its formula was composed of the following: Vitamin b12, Chromium and a Burner Blend (Arginine Alpha Keto Glutarate, Guarana Seed Extract, Natural Caffeine, Caralluma Fimbriata, Dandelion Root, Green Tea Leaf Extract, Red Raspberry Ketones). Each of these ingredients are thought to help support dieting in some way. For instance, vitamin b12 is thought to provide energy. Guarana may aid athletic performance, mental performance and increase energy. Red raspberry ketones is believed to help breakdown fat and may help support better metabolism and healthy blood sugar levels. Caralluma fibriata is thought to block the formation of fat. Dandelion root is believed to help remove toxins from blood. Green tea may help burn fat and boost metabolism. Caffeine can boost mental alertness and is thought to help reduce appetite and boost energy. That being said, simply because it is commonly believed that these ingredients can produce these benefits, this does not mean that they have been clinically proven to do so. There is a very big difference between the potential for positive results and scientific fact. Furthermore, the above list of ingredients reveals that Dub Nutrition Burner has stimulants and diuretics in its formula. This means that there is a possibility that you may experience certain unpleasant side effects, particularly if you have sensitives to these ingredients. In regard to stimulants, in addition to guarana and green tea, each serving size of Dub Nutrition Burner has 250 mg of caffeine (the equivalent to over two cups of coffee). This can lead to side effects such as jitters, restlessness, rapid heartbeat, increased blood pressure and sleeplessness (especially when taken close to bedtime). Diuretics, such as dandelion root, increase the frequency of urination. The suggested use for Dub Nutrition Burner is to take 3 capsules (one serving size) 20 minutes before a workout. If you think that Dub Nutrition Burner may be the right diet pill to support your weight loss efforts, be sure to first consult with your healthcare provider to make sure it is a good option for you. It’s always important to be safe when it comes to your health when taking weight loss supplements. This entry was posted in Non-Prescription Diet Pills Reviews and tagged Arginine Alpha Keto Glutarate, caralluma fimbriata, Chromium, dandelion root, Green Tea Leaf Extract, guarana seed extract, Natural Caffeine, Red Raspberry Ketones, Vitamin B12 on November 28, 2018 by juliec.